For twenty-three seconds, the world's largest bank and backer of the world's most important currency goes dark. Trillions of credits are lost, stolen, or simply erased. Each corp blames the others. Economies, industries, lives collapse. And that’s just the beginning. 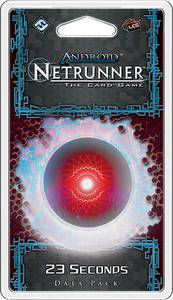 At the beginning of the Flashpoint Cycle, Android: Netrunner – 23 Seconds provides us our first glimpses of the Android world after the Twenty-Three Seconds incident. Wounded and desperate, the corps act more aggressively than ever. Even as Runners try to take advantage of the chaos, the corps begin to implement extremely powerful—often hostile—ice and operations that come with trash costs. And as the bodies start piling up, they unleash new Terminal operations, like Hard-Hitting News, that are so powerful they immediately drain the Corp's remaining clicks once they're played. Trillions of credits, millions of lives, and the survival of the world's largest megacorps—the stakes in 23 Seconds and the Flashpoint Cycle are as high as they've ever been. Amid the chaos, who will be the first to emerge with a semblance of control? Will it be you?